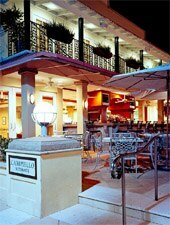 A gorgeous courtyard provides a gracious setting for some of Naples' most sophisticated Italian cuisine. : It’s got a spare, understated elegance achievable only at the best Cal-Ital bistros, this one nestled in the historic Mercantile Building in sunny Naples---Florida, that is, not Italy. Lunch here is an experience that harkens back to the boom-boom ’80s power-lunching phenomenon. Biting into a spit-roasted pork sandwich with red onion and smoked mozzarella, or nibbling the point of a house-made chicken sausage and Gorgonzola pizza slice, everyone looks like a high-powered executive in the midst of clinching a big deal---wealthy, healthy and self-satisfied. But maybe it’s just because the food is good. At lunch and dinner, presentations are simple and flavors are clean and steady, with a gutsy reliance on great produce and slow-roasted meats. The concept originated in Minnesota, but it’s here in Florida that it has become its best self---a sprawling open-air bar (very singles-thronged, especially for those over 40) with live jazz and an affiliated clothing boutique next door keep it jumping all the time and still a tough reservation, even off season.